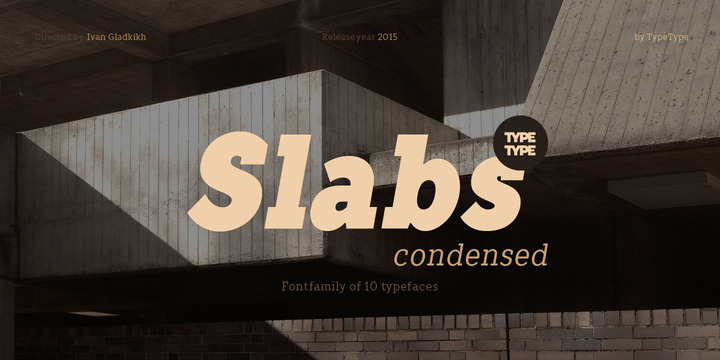 TT Slabs Condensed is a slab serif typeface created by Ivan Gladkikh and published by TypeType which is a condensed version of family font, TT Slabs. It comes in 5 weights matching italics, over 400 glyphs per font and multilingual support. It merge best for logotype and titles, identity and mobile applications. Enjoy! Price: starting from $15 for one font to $120 for all 10 fonts. A font description published on Thursday, November 26th, 2015 in Fonts, Ivan Gladkikh, TypeType by Alexandra that has 2,640 views.